In connection with my recent series, Natural vs. Chemical Sunscreen, I tested five popular, over-the-counter, natural sunscreens on the market. I wore each one for at least an hour, and at least half of that time involved vigorous exercise and/or water immersion. One of the primary, perhaps the main, reason that people do not use sunscreen is that they dislike how they feel – from lightweight and imperceptible to greasy and streaky. Consumer Reports calls this the “yuck” factor. Another important consideration for many is scent. While some prefer unscented or fragrance-free, others prefer varied scents. According to Consumer Reports, favored aromas include: beachy; mild floral bouquet; tropical fruit, particuluarly coconut; citrus; herbal; and outdoorsy. This sensory concern – the degree of sticky and stinky – is such a key issue that Consumer Reports actually includes scent and feel in its rating system, using human sensory testers. Generally, people prefer a lightweight sunscreen, that being one that does not cake all over them and linger. Unfortunately, mineral or sun-blocking ingredients and higher SPF sunscreens are regarded as sunscreen heavyweights. I can totally appreciate the complaint of feeling, what I like to call, gooped up, but I cannot justify it as a reason to put oneself at risk by avoiding sunscreen. Sometimes it takes some trial and error to find a sunscreen that works well for you. I typically do not wear mineral sunscreen. My introduction to it came with the birth of my son, Liam. I followed the American Academy of Pediatrics advice and did use sunscreen on him sparingly from 0-6 months. We live in 75 degree weather pretty much all year long, so I felt it safer to protect him with clothing, shade, sunglasses, and small amounts of sunscreen. I used California Baby – and since it was my first, it holds a special place and serves as a natural (ding! pun intended) jumping off point for this review. To reduce white streaking on clothing, apply natural sunscreen with clothes off and allow it to dry thoroughly before dressing. And for the residual on the palms after application, I have found that baby wipes work well if water is unavailable. 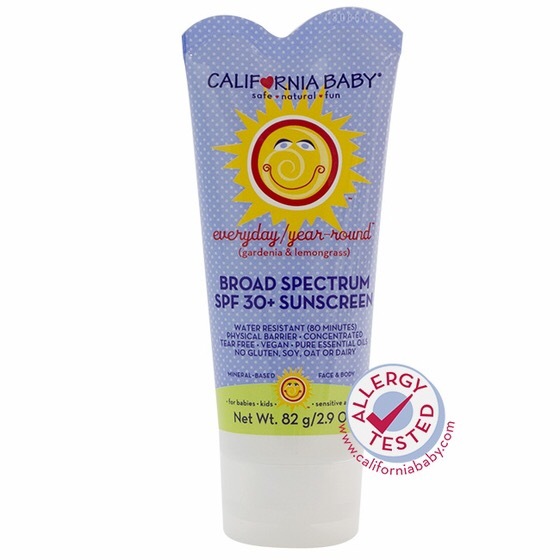 Watch for Part 2 of this post that discusses four more natural sunscreen brands.